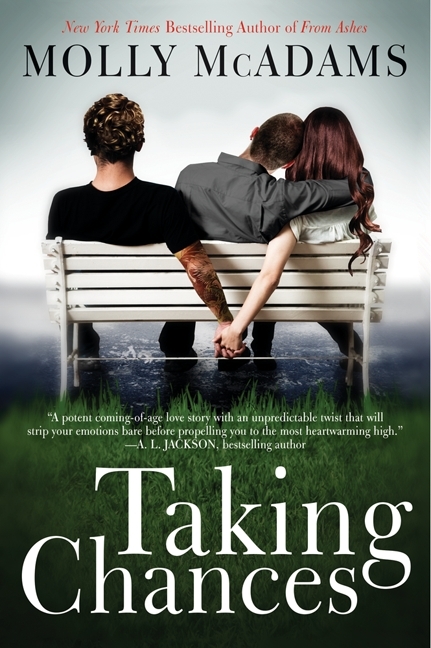 Taking Chances by Molly McAdams was one of those books where I felt all the feelings. I’m not kidding. Name a feeling or emotion and I’m certain I experienced it while reading this novel. This will be a tough review to write because SO MUCH HAPPENED and I can’t get into too many details because that will spoil it for you all before you read it (and you should read it). This was, I believe, my first foray into what’s being called “new adult” these days. Admittedly, I’m still not 100% sure what on earth that label means but from what I can tell it’s essentially sexed up YA that features main characters who are between 18 and 25 years old. If you like YA, you’ll like this. If you don’t mind reading about college freshmen and their escapades, you’ll like this. If neither thing is your cup of tea, I’d suggest avoiding this one. I felt like I really needed to put myself back in a first year university state of mind and, at almost 26, it was almost too much even for me. At times I felt that the situations Harper got into seemed a little unrealistic. For example, she was homeschooled and grew up surrounded by guys in the military, as her dad is a Marine. Do you think dating should be easy for her once she got to college? Hell, do you think college would be easy after being homeschooled for so long?? Neither proved to be difficult for her, thankfully, but it was hard for me to accept that she was able to land on her feet over and over again. There were a couple of other situations near the end of the novel that worked out ridiculously well for her and the rest of the characters (apart from the one, terrible, incident). This was really the reason why this book didn't get more than 4 stars from me. She did have some really brutal experiences but everything wrapped up just a little too well for my liking. Life is just not that perfect and that’s what I struggled with. So far this review is reading pretty negatively but I really did like this novel, I promise. It pretty much consumed me for the two days it took me to read it (it’s a long one, too). I came to a crucial part in the book (the aforementioned terrible incident) just as my train got to my stop on my way home from work and I honestly considered sitting in my car in the parking lot, just to find out what happened. (I didn’t, but I had barely gotten my coat off when I got home before diving back in.) I couldn’t stop thinking about it and even had to go through the entire book with a colleague (who wouldn’t be interested in this book) just because I needed to talk though how I felt about it.